Militants of the Islamic State (ISIS) radical group stoned a young man to death after accusing him of committing adultery, activists in Syria’s eastern Deir ez-Zor province reported on Wednesday. The ISIS-led Islamic Police [al-Hisba] detained the 22-year-old man Ali al-Alian al-Shiwesh in the city of al-Bukamal in southern Deir ez-Zor earlier on Tuesday. The Sharia Court on Wednesday decided to publicly stone him to death on charges of committing adultery. “Dozens of people gathered in al-Bukamal’s central square to witness the execution of al-Shiwesh,” media activist Hazim al-Agidi told ARA News. 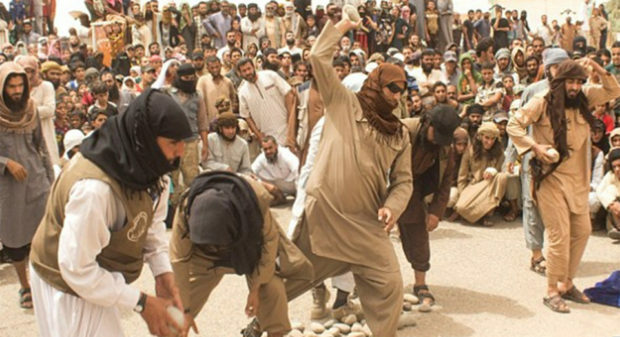 Eyewitnesses reported that ISIS militants have also forced a number of civilians to participate in stoning the young man. “Islamic State members demanded the people to participate in executing the victim, stressing that the people should show commitment to Allah’s Sharia and that the man deserved death for committing adultery,” an eyewitness told ARA News, speaking on condition of anonymity.